Sharing site MegaUpload was shut down by the feds earlier today and its founder Kim "Dotcom" Schmitz was arrested over allegations that his site hosted pirated media. Schmitz also had over $6 million in luxury cars seized. Cars with extremely conspicuous plates proclaiming him, among other things, a "God." Or "The" God. Doctom lived an extravagant lifestyle with cars, planes, and helicopters. 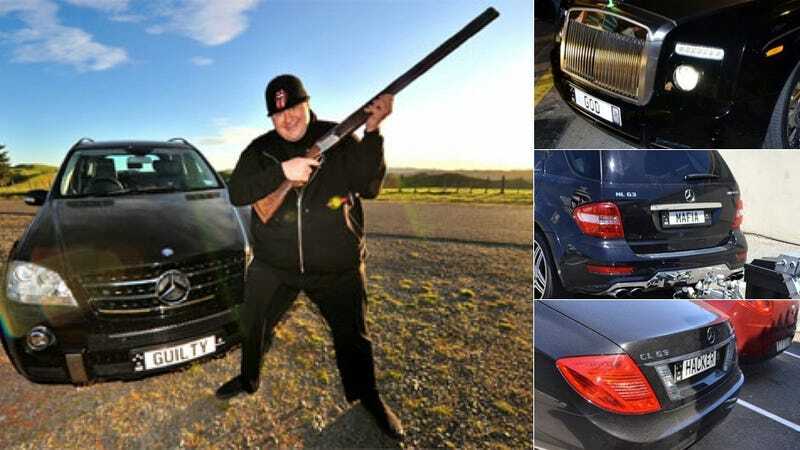 He competed in the quasi-legal Gumball 3000 street race across Europe a few years ago in a modified Mercedes and has a penchant for driving around golf courses. 2010 Maserati GranCabrio, VIN ZAMKM45B000051328, License PlateNo. "M-FB 212" or "DH-GC 470", registered to FINN BATATO;67. 2009 Mercedes-Benz E500 Coupe, VIN WDD20737225019582, LicensePlate No. "FEG690"
2005 Mercedes-Benz CLK DTM, VIN WDB2093422F165517, LicensePlate No. "GOOD"
2004 Mercedes-Benz CLK DTM AMG 5.5L Kompressor, VINWDB2093422F166073, License Plate No. "EVIL"
2010 Mercedes-Benz S65 AMG L, VIN WDD2211792A324354, LicensePlate No. "CEO"
2008 Rolls-Royce Phantom Drop Head Coupe, VINSCA2D68096UH07049; License Plate No. "GOD";72. 2010 Mercedes-Benz E63 AMG, VIN WDD2120772A103834, LicensePlate No. "STONED";73. 2010 Mini Cooper S Coupe, VIN WMWZG32000TZ03651, License PlateNo. "V";74. 2010 Mini Cooper S Coupe, VIN WMWZG32000TZ03648 LicensePlate No. "T"
989 Lamborghini LM002, VIN ZA9LU45AXKLA12158, License PlateNo. "FRP358"
Some of his cars and boastful license plates in the image above from Spotte.rs, which has a nice collection of his cars.